Why don't we talk about mental models? When I first learned the term "mental model", it made perfect sense to me. A mental model is the reader's mental representation of a text--the amazing combination of ideas from the text and the reader's background knowledge. In the classroom, I see it as my task to help readers develop rich mental models of the texts that we share and their own self-selected texts. Thinking about what kinds of mental models my readers have created--and where their comprehension problems might be--guides my instruction. For example, this week some of my struggling readers completed a cloze passage. Looking at their responses, and thinking about what clues they were or were not using, helped me to figure out where to go next. I could see which students were reading sentence by sentence, and which students had developed a more global view of the text. Garlic mustard escaped from gardens. When we talked about it, I found out that they were visualizing the actual garlic mustard plant walking out of the garden! (What a great mental image!) However, they knew that this couldn't happen, so the sentence "clunked"--that is, they didn't understand it. Getting them to talk about this mismatch in their mental models helped me to guide them toward the inference they needed to make in order to understand this sentence--the garlic mustard plants didn't escape, but the seeds did. But not many people around me are talking about mental models. In fact, in the entire Pennsylvania Comprehensive Literacy Plan--a document meant to guide all Pennsylvania schools in their literacy instruction--the term "mental model" is mentioned only once, as an aside in a bullet point about the values of read aloud. So why don't we talk about mental models more? Is it because there is no quick and easy test? We can't graph it, we can't count it, so it must not exist? Or are the conversations going on, and I'm just now aware of them? I'd love to know! Variety, variety, variety. This is what we should be pushing students toward in independent reading--a broad range of genres and texts. Right? Well--maybe not. In the last few years, I've come to appreciate the value of "narrow reading." (This article by Stephen Krashen is an excellent introduction to the term.) While narrow reading is often suggested for ELL students, I think it has great value for emergent and striving readers as well. What is narrow reading? Consider the case of my youngest son. This year, every single book he has checked out from the library has been an animal nonfiction book. Every single one. As he has become a more confident first grade reader, he has found words and ideas that appear in every book--animal, baby, habitat, predator, prey. These words that show up again and again have become his cornerstones for decoding other unfamiliar words. His narrow reading is not at all limiting to him. In fact, it's empowering. A student in my reading class has done something very similar. This year, he has read my entire collection of Horrible Harry books. "Harry's not quite so horrible in this book," he told me one day. He knows the characters and the settings of the books quite well, allowing him to allocate more mental resources to track the plot. (He tried a Secrets of Droon book today--I hope he likes it!) Another student, an ELL reader, has been working on The Spiderwick Chronicles since October. Yet another student has taken the fourth grade equivalent of Aidan's track, reading every animal book that I have in my classroom. Narrow reading has a role in instruction, too. As I've been wrapping up text structure, we've been reading a series of related texts about vernal pools. These texts have different text structures, but show similar main ideas and vocabulary. This is so helpful for struggling readers, especially in the area of making inferences. Many students have trouble with making inferences because of a lack of background knowledge. When we read related texts, these students get the background knowledge they need about the topic. As we were doing a repeated choral reading of "Salamander Crossing", I decided to ask an inference question based on the morning's science lesson. "Do you think that mole salamanders are nocturnal, or diurnal?" I asked. Because the text mentions mole salamanders migrating at night, the students were able to answer this fairly easily. But one student said thoughtfully, "Why are they nocturnal, I wonder?" Another student--one who often struggles with answering multiple choice questions--blurted, "Because of moist." When we looked at him, he added, "You know, they have to stay moist. They're salamanders." Those of you who work with struggling readers know that this is what we live for. Unprompted question, unprompted response, unprompted support for that response--these are the actions of real readers. In this case, our narrow reading gave these students the mental space to try out these more sophisticated reading strategies. But now, as the ice melts and I start to think about going to look for salamander eggs in the vernal pools, our focus changes--from text structure to a return to fiction. Over the next few weeks, as state tests tromp through our days, we'll take a closer look at making inferences in fiction. It's about time for me to assess text structure! What should students know and be able to do? What should we look for? These are some tasks that I've used for both formative and summative assessments. When teachers are just starting to work with text structure, this kind of assessment seems the most logical. And there is merit to it. Present students with multiple well-written paragraphs, all on the same topic, and have students identify the text structure of each one. This can show if students are sensitive to the cue words that authors use to identify various structures. But this shouldn't be the only assessment of text structure. 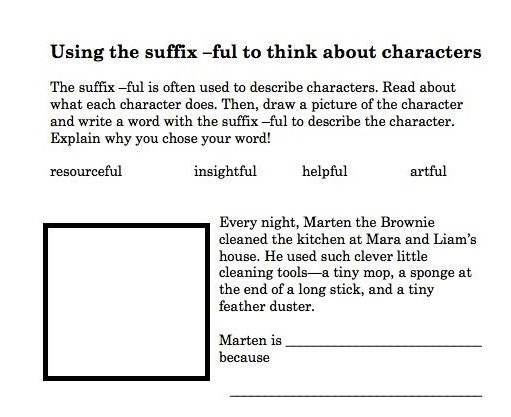 While it does measure if students can identify different text structures, it doesn't show how a reader is using a text structure. Tasks like completing graphic organizers, answering multiple choice questions, and answering open-ended questions can help to show what students can do with a text. For early readers, it's helpful to provide a graphic organizer that goes along with the structure of a text. You can even provide sentence starters within the parts of the graphic organizer. Last week, my students read a short text about the Great Peshtigo Fire, and then completed a partially filled-in cause and effect graphic organizer. Their struggle with the graphic organizer showed that they were still having big difficulties with navigating a cause and effect text. Older readers can be asked to create a graphic organizer from scratch. Asking kids to create their own graphic organizers is always a worthwhile task--as a teacher, I learn so much about how they are representing ideas in their minds. For example, many of my students try to use webs for everything. If a student reads a compare and contrast text and tries to represent it with a web, this gives a good indication that the student is not noticing the dual topics of the text. Open-ended questions can help teachers to see how kids are using text structure to go back to find details from a text. Often, the text will suggest a good open-ended question. Here are some stems that you can use help you think about framing questions. Chronological Order: Explain the process of _____ . Cause and Effect: What were the effects of ____? Problem and Solution: According to the author, what are some possible solutions for the problem of____? Compare and Contrast: How are ____ and ____ different? Of course, this is the old standby. But the right questions can give you some good insight into what kids are able to do. What I like about multiple choice questions is that you can ask both global (related to the whole text) and local questions. I also like to include synonyms for different text structures to help kids think flexibly--for example, sequence for chronological and result for effect. Multiple choice questions do put some struggling readers at a disadvantage. These readers often have significant problems when they are posed with distractors that are all true. (I wrote more about this in The Forest and the Trees) This is why I like to supplement multiple choice questions with other kinds of tasks. Chronological Order: Which event came before _____? (Note: These questions proliferate on standardized tests and are very difficult for kids! Teach students how to mark the named event in the text and use the chronological order to find the events in the choices.) Which event happens first in the text? Which event occurs last? Cause and Effect: Which is an EFFECT of _____? (I like to put in some causes as distractors. This tells me quickly which kids are having trouble with the order of cause and effect.) Which event did NOT cause ______? Problem and Solution: Which best explains the cause of the problem____? Which is a solution for _____? Compare and Contrast: Which is a similarity between ___and ____? Which is a difference between ____ and ____? Reading Homework: What to Do? What should reading homework look like? As I've taught at different grade levels, I've struggled with this. On the one hand, I would love to think that students are reading on their own for pleasure each night. But I've had several parents tell me, "I can't get __ to read at home unless it's an assignment!" As a parent, I have come to appreciate predictable homework routines. I love it when we do the same kinds of assignments, week after week. I know that my seventh grader will have an Article of the Week assignment each week, and that my first grader has a book to read each night. The homework routine that I've come to use in fourth grade is a blend of approaches. (That's pretty much me--finding the middle path!) I do like to provide students with a weekly text to read. I think that having shared texts gives our class a common ground for discussions. I also like to keep practicing multiple choice questions throughout the year. 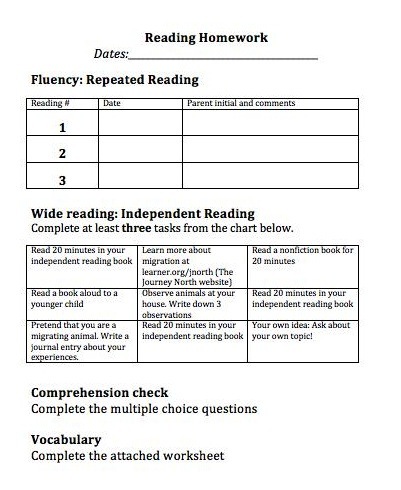 But students also have the opportunity to add self-selected reading to their weekly work. 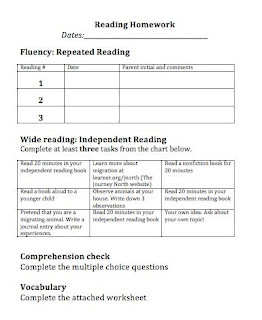 The Wide Reading menu gives students a variety of choices for independent reading. Students can choose to read their independent reading books for all three sessions. I add in a few other possibilities, such as following a recipe, visiting a website, or reading a magazine. I change these each week, with the choices sometimes matching the content of our shared reading. What about fluency? Students practice reading the shared text aloud three times during the week. I put a place for parents to initial and write comments on the assignment sheet. Sometimes parents write notes about words that were problematic each night, or how the student progressed with showing expression over the course of the reading. I always appreciate what they have to say. A weekly homework routine is friendly for families who are rushing from activity to activity. I run mine from Monday to Monday, which gives students the weekend if needed. Many students turn their assignments in early, on Thursday or Friday, so that they have the weekend free. Reading homework is a way to extend what we do in our classroom. For many parents, the weekly homework assignments are a way to check in with their growing reader and enjoy some activities together. An example of the whole packet is posted over at Slideshare and embedded below. 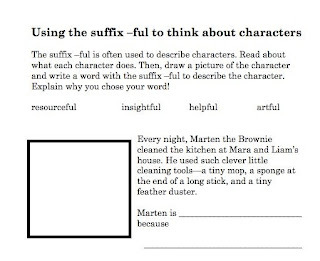 Our next suffix is the suffix -ful. This suffix is not a difficult one for most students. As I teach it, I'm trying to make the connection to describing characters. Words with the suffix -ful are often used as we write to describe character traits--helpful, resourceful, cheerful, playful. I'll stretch readers with a few words that we don't generally use in daily conversation--insightful, spiteful, artful. I'm enjoying having the time to focus on word work. But I can't ignore the slightly unraveled feeling that I'm starting to get as I think about the state testing--coming up in 21 instructional days. (Who's counting? I am...as I think about what I still need to work on with students!) More on this unraveled feeling--and what I'm doing about it--next week!